Place the chocolate chunks in a small bowl. Place over a small saucepan of barely simmering water. Stir until the chocolate is melted and smooth, about 3 minutes. Set aside to cool slightly. 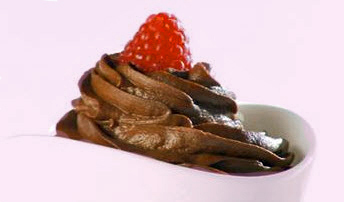 Place the melted chocolate, avocados, cocoa powder, agave, vanilla, and milk in a food processor. Blend until smooth and creamy, scraping the sides of the bowl as needed. Spoon into glasses and refrigerate for at least 3 hours (can be prepared 1 day in advance). Garnish with fresh raspberries and serve.